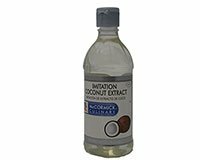 McCormick Imitation Coconut Extract adds a tropical flavor to any recipe. The clear color of McCormick Coconut Extract makes it a perfect addition to white icing. Coconut Extract also a great flavor in smooth frosty drinks. Use Coconut Extract to add tropical flavor to pies, ice cream, sorbet, chocolate, frostings, fruit salads, drinks, muffins, breads, pancakes, waffles, French toast, syrups, marinades, fruit punches, curry sauces and Thai sauces. Ingredients: Water, Alcohol (21%), Propylene Glycol, and Artificial Flavors. Combine all ingredients together in a mixing bowl. Allow to set for 30 minutes to allow flavors to blend. Serve with chicken, port and fish. Yields 24 Servings. Combine 3 cups of softened cream cheese, 1 tbsp Imitation Coconut Extract, 2/3 cup of crushed pineapple and 1 tbsp sugar in a medium sized bowl. Mix well to combine, then cover and place in refrigerator for 30 minutes. Remove and let soften the stir again. Use as a spread for bagels, pastries and quick breads. Combine 2 1/2 cups orange juice, 2 1/2 cups canola oil, and 2 1/2 tsp Imitation Coconut Extract. Wisk well with a wire whip, and salt and pepper to taste. Use as a salad dressing for a light summer salad. Toss with cooked chicken for a tropical chicken salad. Makes 5 cups of Coconut Orange Dressing.